Chef Kevin is always looking to add healthy but amazing appetizers to our menus, like our crab and avocado tower at George & Martha’s or our extremely popular deviled eggs at The OFFICE. If you find yourself starving during the day, and you are not around a 40NORTH restaurant, order a tasty appetizer to go or try snacking on one of these recipes. Cut a banana in half and spread peanut butter and marshmallow crème on the insides. It will bring you back to your childhood! Get the recipe here. 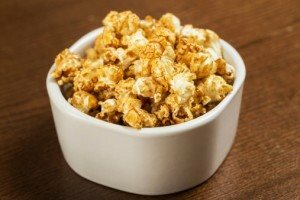 This recipe involves covering popcorn with a mixture of maple syrup, butter, salt and ground red pepper, then baking it for 15 minutes. If you’re making this for your kids, consider omitting the red pepper, which might be too spicy. Find the recipe here. Bake kale leaves with olive oil, then sprinkle them with grated parmesan. Delicious! Get the details here. Spread mayo in a thin layer on one slice of seven-grain bread, then top with tomato (ideally heirloom), avocado and another piece of bread. This is easy to prepare in advance, tastes great and is very healthy.Find the recipe here. This protein- and fiber-rich snack—which you can make ahead of time—involves roasting chickpeas brushed with olive oil and seasoning. You can eat them at room temperature or reheat them. Get the recipe here.